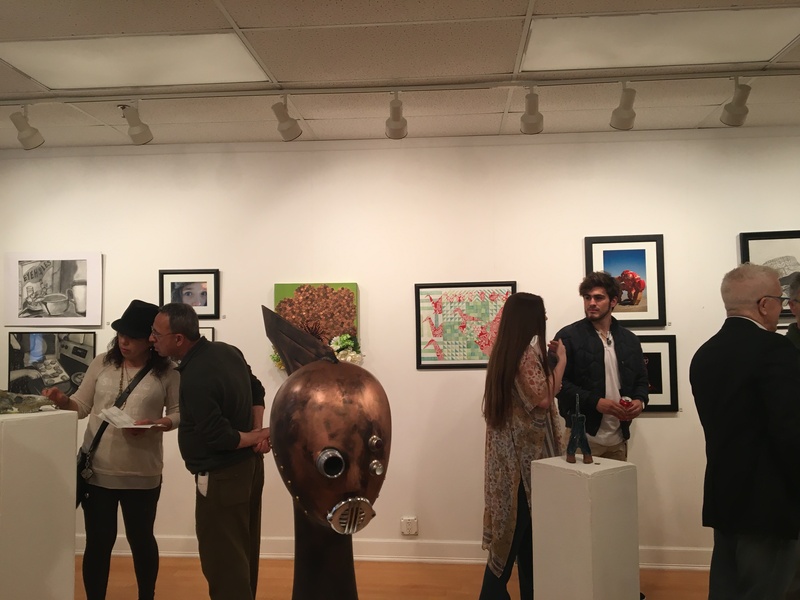 BLACKWOOD – Camden County College hosted its 50th anniversary student art show on April 26 in the Marlin Art Gallery in Lincoln Hall on the Blackwood campus. The art show was split into three attractions: the gallery, the sculpture garden outside the gallery, and later a presentation called “Mad Lit Live” in the Dennis Flyer Theater. Students from various art programs at CCC submitted pieces in the forms of photographs, paintings, sculptures, poems and video productions. “The student art show is one of our best art shows,” said Judith G. Rowlands, dean of the arts at CCC. The opening of the sculpture garden drew attention at the opening of the show, as guests stood outside to appreciate the larger pieces in the show. Among the students who submitted work to the art show was Michaela Salvo, who had two photography pieces in the show. The second-year student on the Blackwood campus said she “had two pieces in the art show last year” as well. In addition to the pieces of art, the department also provided refreshments for guests who wished to have a snack while they took a walk through the exhibits. Trustees, parents and other family members gathered to be a part of the event. Staff and faculty were also part of the crowd. “Mad Lit Live” was new to the show and took place just a few steps away in the Dennis Flyer Theater, where students recited poems and presented their video productions to an audience full of their family and friends, as well as their mentors among the college faculty and staff. Klotzbach said she anticipated the addition of the two new segments “would create an exciting art festival” when discussing the thought process behind the event. The exhibit of student artwork will remain in the Marlin Art Gallery for visitors to view until May 19.